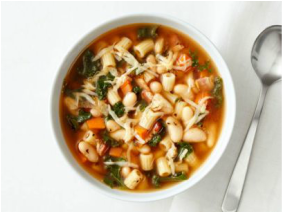 quick & balanced meals & snacks for the whole family! Here are some recipes to try this season that are easy to make and take on the go as a snacks or in a picnic. Marathon County is such a beautiful part of Wisconsin with many opportunities for family fun and recreation. If you’re looking for ideas, click these links for a range of outdoor activities and events going on this summer. ​Prep: 20 min. Cook: 40 min. In a large pot melt butter. Add onion and cook until translucent, about 8 minutes. Add squash and stock. Bring to as simmer and cook until squash is tender, about 15 to 20 minutes. Remove squash chunks with a slotted spoon and place in a blender and puree. Return blended squash to pot. Stir and season with nutmeg, salt and pepper. Serve. Put the bacon in a large pot or Dutch oven over medium heat and cook, stirring occasionally, until crisp, about 4 minutes. Add the onion and cook, stirring occasionally, until slightly softened, about 3 minutes. Add the carrots, garlic, tomato paste, thyme and 1/2 teaspoon each salt and pepper and cook until the carrots begin to soften, about 2 minutes. Add the chicken broth, 6 cups water and the parmesan rind. Increase the heat to high; cover and bring to a boil. Add the pasta and beans and cook, uncovered, 5 minutes. Reduce the heat to medium and add the kale. Simmer, uncovered, until slightly thickened, about 7 minutes. Remove the parmesan rind, stir in half of the grated cheese and season with salt and pepper. Ladle into bowls and top with the remaining cheese. In a large pot cook all the meat at once in hot oil over medium-high heat for 15 to 20 minutes or until brown, stirring occasionally. Drain off excess fat. Add the 4 cups water, sliced onion, garlic, Worcestershire sauce, lemon juice, sugar, salt, paprika, pepper, bay leaf, and allspice. Bring just to boiling; reduce heat. Simmer, covered, for 2 hours, stirring occasionally. 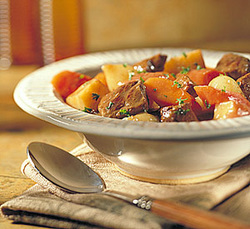 Stir in carrots, halved onions, and potatoes. Return to boiling; reduce heat. Simmer, covered, about 30 minutes more or until meat and vegetables are tender. Discard bay leaf. In a screw-top jar shake together the 1/2 cup cold water and flour until combined. Stir into stew. Cook and stir until thickened and bubbly; cook 1 minute more. Season stew to taste with salt and pepper. Sprinkle each serving with snipped parsley, if desired. Makes 6 servings. Preheat the oven to 400 F. Have ready an ungreased nonstick baking sheet. In a large bowl, combine the flours, wheat germ, baking powder, baking soda and salt. Whisk to blend. Add the butter to the flour mixture. With a pastry blender or 2 knives, cut the butter into the dry ingredients until the mixture resembles coarse crumbs. Add the buttermilk and stir just until a moist dough forms. Don't overmix. Cover the bowl with plastic wrap and refrigerate for 30 minutes. Turn the dough out onto a generously floured work surface and, with floured hands, knead gently for 6 to 8 times until smooth and manageable. Using a rolling pin, roll the dough into a rectangle 1/2-inch thick. Using a 2 1/2-inch round biscuit cutter dipped in flour, cut out biscuits. Cut close together for a minimum of scraps. Gather the scraps and roll out to make additional biscuits. Place the biscuits about 1 inch apart on the baking sheet. 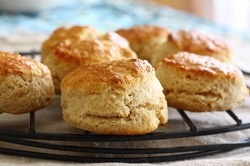 Bake until the biscuits rise to twice their unbaked height and are lightly golden, 8 to 10 minutes. Serve hot. In a mixing bowl, beat egg whites and salt to soft peaks, then add sugar and beat again until peaks are stiff. Beat in almond flavoring. Using a rubber spatula or wooden spoon, stir in half of the coconut. Sprinkle in the nutmeg and flour, stir, then fold in the remaining coconut. Using a melon baller or other small scoop, or working with 2 spoons, form 9 "snowballs" a couple of inches apart on each of 2 cookie sheets. Bake snowballs 12 to 15 minutes, until lightly golden. Remove from oven and garnish each snowball with half a cherry and a couple of slivered almonds. Transfer to a rack or serving plate to cool.